God Bless Farmers Scroll Saw Pattern. There are approximately 2.5 million farmers in the US. That's down about 3% over the last 10 years. Over the last 30 years the average age of the farmer increased for 50.5 years to 58.3 years. 57 percent of farms produce less than $10,000 in sales. 18% are over $100,000 in sales. Every year the addition of new farmers goes down. Farm life continues to change. One thing that does not change is how hard the farmers work. 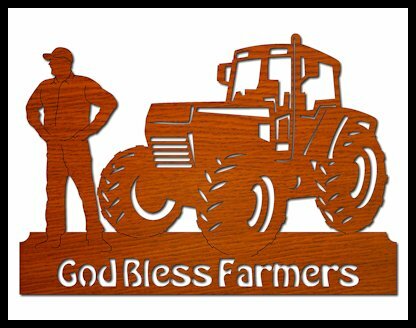 Thank you to all the American farmers. Almost every community has a farmers market. Buying you produce from them is a great way to support your local farmers and get better tasting food. Last chance to enter this months $75 Bear Woods gift certificate giveaway. Visit these fine sponsors of the Scrollsaw Workshop. Do you buy from Amazon? If you do and would like to support the Scrollsaw Workshop please use this link to make your purchases. My Amazon Affiliate Link. 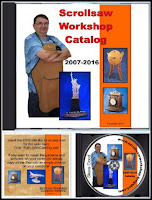 Your price stays the same and the Scrollsaw Workshop gets a small commission. Thank you for your consideration. Special Collector's Edition - American Icon Provides Weather, Wit, and Wisdom That's Shockingly Relevant! From the human condition to nature's sweet mystery, Farmers Almanac delivers almost two centuries of history. 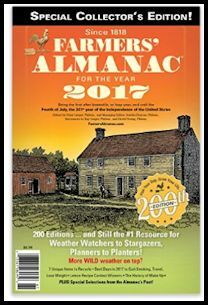 Farmers' Almanac celebrates its 200th anniversary with a special edition that includes original advice and lore from the early days of this American icon. Since 1818, the publication has made itself an indispensable part of American life, providing an eclectic mix of weather, astronomy, humor and everyday life hacks before the term even existed. This 200th anniversary edition takes a look back at 200 editions worth of archived advice and finds material that is clever, forward-thinking, and occasionally very strange, including: Advice to Girls (1876); The Power of Sunshine (1869), The Art of Kissing (1896); and How to Quiet a Fussy Child (1878). And according to the special edition, here's a look at what s coming for next year: Winter is Coming! Will entire cities turn into frozen armies of White Walkers? For the first time in 26 years a Total Solar Eclipse will be visible from the United States in August 2017. Get the details of when and where to view this awe-inspiring event. How did our pets get from the barn to our bedrooms? They used to work for us, chasing mice, herding sheep, and pulling plows now we work for them. We buy gluten-free pet food. It s happened with cats and dogs, are pigs and chickens next? Speaking of chickens, from the country to the city, chicken lovers are raising happy cluckers with help from Farmers' Almanac. What should you feed your hens? Do you need a rooster to get eggs? It's all in this special Collector's Edition of the Farmers' Almanac.